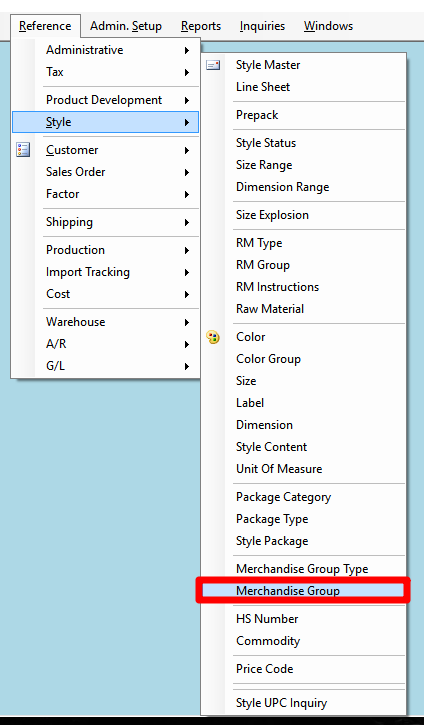 This section explains what merchandise groups are, how they are used, and the steps for creating them. 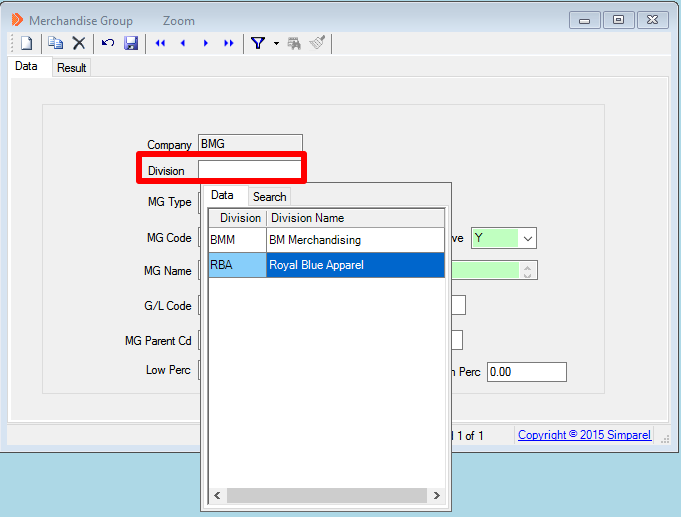 You will need to create these merchandise groups before attempting to create new designs in Simparel. 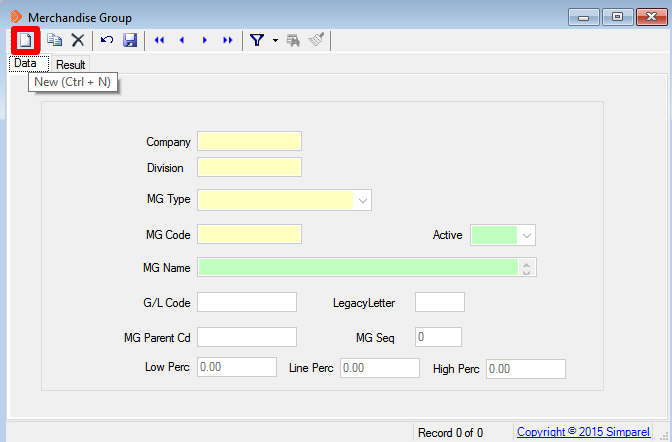 They make it easier for other departments to organize information and reports about designs. Simparel uses them to auto-generate style numbers. Fabric - The primary fabric of the design. If the design is mixed-media, pick the most prominent fabric. Details - A catch-all for any remaining features of the design that are not captured by the other groups. Pick just the most prominent detail feature, if there are more than one. The Merchandise Group window will open. 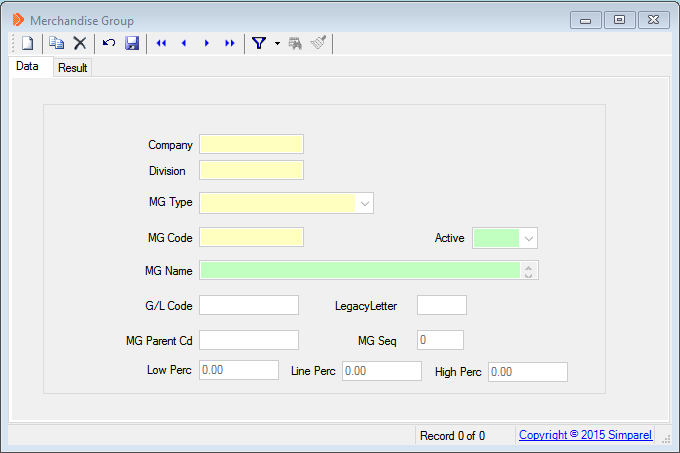 Click on the arrow next to MG Type to open a drop-down menu showing all the MG Types. Click on the MG Type you want. 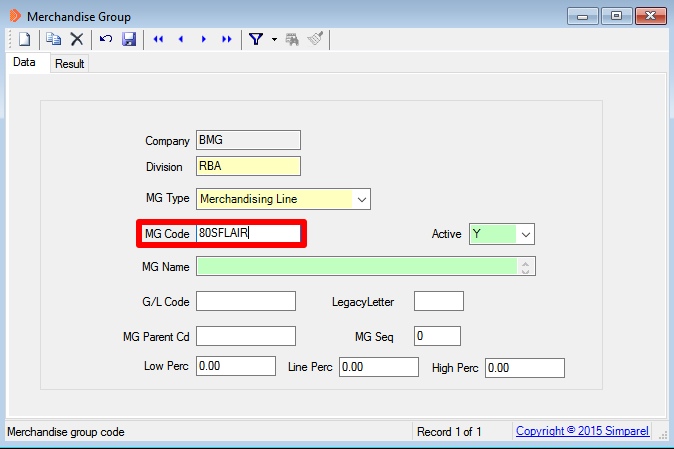 Come up with a code for the Merchandise Group you are creating. The code should be short but should also be fairly representative of the name of the group you are creating. For example, if the name of the group you are creating is called "Fashion Denim", then a good code would be FDENIM. Something like BJOFG3 would not be a good code since you would never be able to tell that code has anything to do with Fashion Denim. 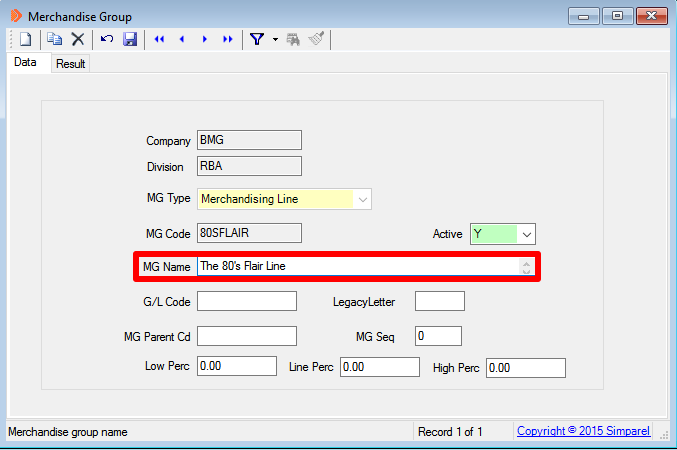 Next to MG Name, type in the full name of the merchandise group. Simparel will use the data for the Fabric, Fashion Tier, and Body merchandise groups to auto-generate style numbers. Therefore, you must pay extra attention when creating these merchandise groups. The first letter of the style number is determined by the fabric. The image below shows the record for Fleece. Note that the data under LegacyLetter is what will go into the first letter of the style number. 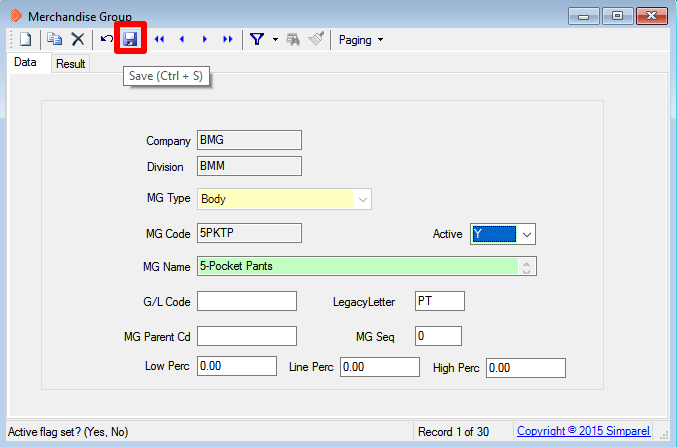 Therefore, when you create a new fabric, make sure to type in a letter under LegacyLetter for the system to use in the style number. Unfortunately, the system cannot repeat letters for different fabrics so if a more obvious choice is already taken, then you may have to come up with another letter. The second digit in the style number is a number that is determined by the Fashion Tier. The image below shows the record for Fashion. Once again, the data under LegacyLetter is what goes into the style number. When you create a new fashion tier, make sure to type in a single digit number under LegacyLetter. Simparel will not take repeated numbers so make sure that the new number you are using has not been used before. The third and fourth digits of the style number are reserved for the body type. The image below shows the record for 5-pocket pants. 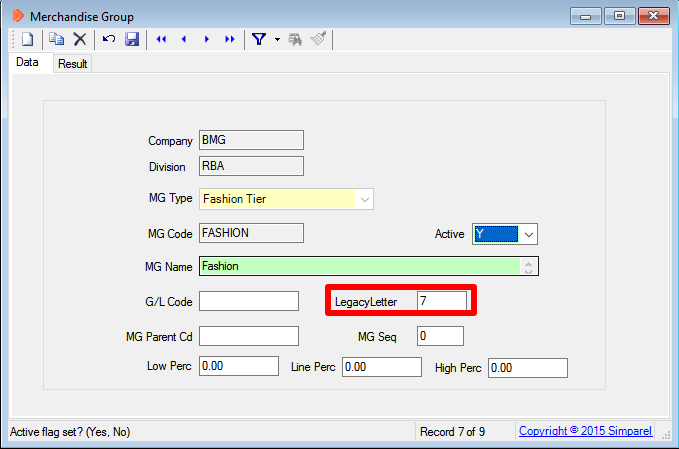 As with Fabric and Fashion Tier, the LegacyLetter determines the code that goes into the style number. 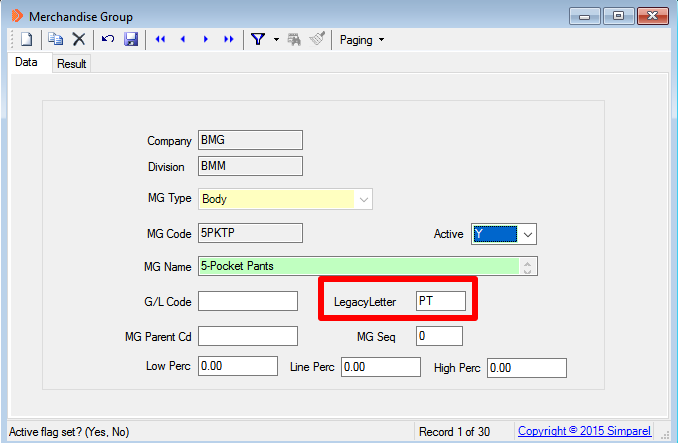 When you create a new body type, make sure to type in a two-digit code under LegacyLetter. DO NOT use numbers here. Simparel will not take repeated codes so make sure that the new code you are using has not been used before. Click Save at the top right of the window.